Dentures conceal tooth loss as well as restore your oral health and functionality. Missing one tooth, several teeth, or all of your natural teeth causes cosmetic and functional problems. You may never smile with your whole mouth without a full set of teeth. With teeth missing, it’s more challenging to chew food and speak clearly. Not replacing the missing teeth promptly puts you at risk for developing infections in the open area. Empty space also causes your remain teeth to gradually shift towards that spot. With dentures, you can fill those gaps and smile with confidence again. A patient at a checkup for her dentures. Dr. Ahmed will recommend complete dentures when you no longer have any of your original teeth. This is a set of top and bottom replacement teeth that fit snugly against your gum line. Partial dentures are the ideal solution when you are missing multiple teeth on the same arch of your upper or lower teeth. A dental bridge holds the denture in place when you only need to replace a single tooth. 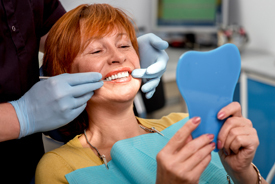 When getting complete dentures, you have the option of selecting immediate or conventional. 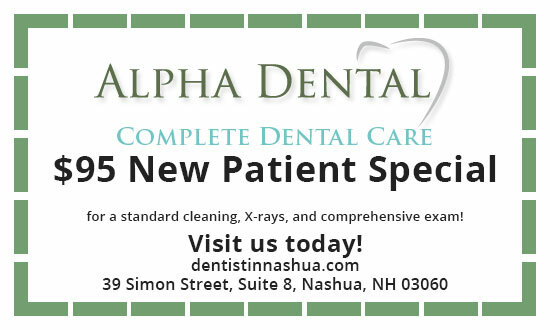 If you have your natural teeth extracted at Alpha Dental, our laboratory assistants prepare your dentures so they are available to install in your mouth right away. This does require you to return to our office at least two additional times for adjustments once your gum tissues have had the opportunity to heal. Conventional dentures require you to wait approximately six weeks for healing before your dentist can place them. Both types should last several years before replacement becomes necessary. Getting new dentures requires a commitment to coming to our office for regularly scheduled appointments while Dr. Ahmed prepares you for the procedure. Accurate measurements of your gums, jaw, and teeth are essential so our dental laboratory can create your customized dentures. The process also requires patience as your dentist works with you to determine the proper color and shape of your new teeth. You should expect to go through an adjustment period after your new dentures are finally installed. This may include mouth tenderness, speaking and chewing difficulties, and an accumulation of saliva for the first several days after the procedure. These symptoms are completely normal. Luckily, they should disappear without further intervention before the end of the first week. However, if they persist, or you experience additional symptoms that bother you, contact our office and we’ll get you in for a possible adjustment. Whether your dentures are full, partial, immediate, or conventional, they can help you enjoy life to the fullest again. Please contact us today to schedule your initial consultation. During this session, one of our dentists will let you know which type of dentures are most appropriate for your situation.